Blizzard has punched out a pair of patches for its team-based (and, let us recall, not yet released) shooter Overwatch, which make a number of "experimental" changes to matchmaking, tweaks the Hero balancing, and even finds time to fix some bugs. Overwatch Game Director Jeff Kaplan also took to YouTube to discuss the changes and the progress of the beta thus far. A lot of the changes made by the patches are "under the hood," as Kaplan explains, with particular attention being paid to matchmaking. "I sort of want to apologize in advance, because there might be moments where you get some imbalanced matches. There might be moments where you have to wait a little bit longer for matches," he says. "We actually think it'll be the opposite, that you'll get matches quicker, but they probably, might not seem as fair, because we're doing a lot of experimentation." But, as he noted, that's the whole point of a beta test, and so far it sounds like things are going well. Of course, it's a closed beta, which means you might not be able to play just yet, although Blizzard said it intended to invite "a lot more players" into the action for this weekend's stress test. The full Overwatch beta patch notes are available here and here—two separate updates, remember. If you're in the beta and own a GeForce card, don't forget to snag the latest Game Ready drivers; if you're not (and want to be), make sure you've opted in to beta tests on Battle.net, and keep your fingers crossed. 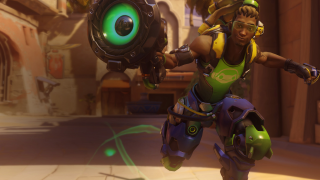 Overwatch is expected to be ready for launch sometime in the spring of 2016.